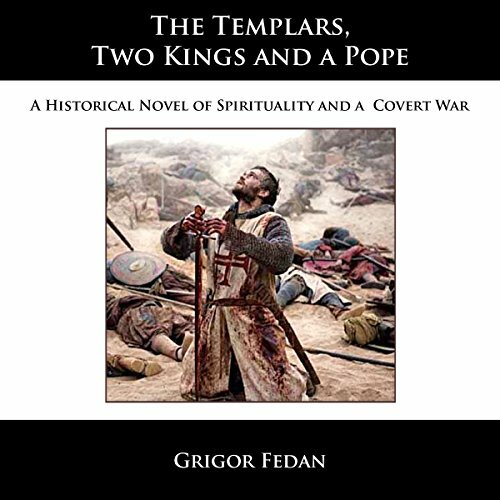 The Templars, Two Kings and a Pope is the novelized reconstruction of a crucial 25-year period in Templar history, before the Order of the Temple was disbanded. At one level, this is the story of a covert war, of the secret organization known as The Brotherhood, and of the one man who stood at the center; a Swiss named Lord Otto de Grandson who became England's King Edward I's right-hand man. At another level, this is a spiritual story about Jesus' secret teachings that he reserved for the select few. This came to light with the discovery of the Naj Hammadi documents. These teachings became the Brotherhood's reason for being, why they fought their covert war against France's King Philip IV, and the motivation behind their quest for democracy that led to the creation of Switzerland, the French revolution, and the United States. This novel is a factual account of events, and a realistic depiction of what it was like to be a Knight Templar and of life in medieval times. great story and a twist on what you know about the templars. I found it engaging despite somewhat flat narration. The novel was interesting. The storyline a little hokey at times. The historical aspects were carefully woven in. Not what I expected or might have chosen but good enough for one time through. One of my favorite books of all time. This gives a very easy to read/listen history of the most exciting part of the Templars. I started searching for the Gnostic gospels as soon as I finished. To my knowledge the Jesus Gospel itself is not available, but there are others including the Gospel of Judas, Mary Magdaline, etc. Regarding the narrator, you have to get used to him. Give the book a chance and you will be enthralled in no time. Would you listen to The Templars, Two Kings, and a Pope again? Why? No I would not; I think I got everything I was looking for during the first time. Templars historical events, of course some fiction is ok. If you could rename The Templars, Two Kings, and a Pope, what would you call it? Title is ok with me. I have tried to listen to this book but the reading is so poor that I had to stop. The reader is so bad that when he sees the word quay(as in where you find a boat) he pronounces it kway instead of key, and he does this several times. The voices he uses for the diferent characters are not right. I was laughing out loud at some of the voices he uses(he even has one monk sounding like dracula). He reads without feeling. This may be a good book but I found myself listening to how bad the reading was and not able to concentrate on the story. I think that if Grigor Fedan heard this reading of his work he would be very unhappy.